The March shipment of the Empire State Cellars Wine Club will ship this week, so it's time to tell you about the picks. Admittedly, I had a little help with the wines this time around... thanks to our annual Wines of the Year tasting back in January. Many of this shipment’s wines won “Wine of the Year” for their region and style. One even won our overall New York State Wine of the Year. If you're not familar with the club, you can learn more here. Keuka Lake Vineyards 2010 Semi-Dry Riesling: Ripe, forward and apple-y, this well-balanced riesling is fruity enough for lovers or sweeter-style rieslings, but shows a crisp, citrusy edge to it that keeps it from being cloying or flabby. This was one ofthe finalists in our Finger Lakes riesling flight, and although it didn’t win, it was a standout. Arrowhead Spring 2010 Pinot Noir: Pinot noir — pinot that tastes like pinot anyway — under $20 is a bit of a Holy Grail. It’s not easy to find and when you do, you stock up on it. This wine, which won “Red Wine of the Year” from the Niagara region this year, is one such wine. I’ve gone through at least half a case in the past few months. It’s agreat value. The Grapes of Roth 2009 Riesling: German-born winemaker Roman Roth — better known as Wolffer Estate’s winemaker — has a way with riesling, but this is my favorite from him yet. Made from fruit grown in Split Rock Vineyard outside of Greenport — one of the North Fork’s cooler sites — this wine features a laser beam of focused, wet-stone minerality. Ravines 2009 Pinot Noir: 2009 was not a great red wine vintage in the Finger Lakes but, pinot noir doesn’t need all of the dry heat that other varieties do. So, the best growers and winemakers made some delicious wines, including this one. With layered flavors of red fruit, spice and earth, this is an Old World pinot lover’s pinot. Hermann J. Wiemer 2010 Dry Riesling Reserve: The flight of Finger Lakes rieslings that the team and I tasted through was filled with quality wines, butthis wine stood out — winning Finger Lakes White Wine of the Year. Focused and complex, with myriad flavors and a wonderful mouthfeel, it is a stunning example a dry Finger Lakes riesling. Billsboro Winery 2010 Syrah: This wine, which won Finger Lakes Red Wine of the Year, was perhaps the most surprising of the tasting for me. Most New York syrah is underwhelming, but not this one. 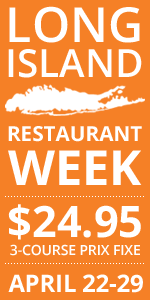 A warm, long growing season ripened the fruit (grown on the south-eastern shores of Seneca Lake) without sapping it of its natural balance. Chateau Frank 2006 Blanc de Noirs: Winner of both Finger Lakes Sparkling Wine of the Year and New York Sparkling Wine of the Year, thiswine from one of the best known producers in the state shows that while riesling rules the Finger Lakes,the soils and climate are ideally suited for sparkling wine production. Peconic Bay Winery 2007 Lowerre Family Estate: Named overall New York Wine of the Year at our tasting — the first time any wine has done so — this merlot-heavy blend of Bordeaux varieties shows the ripeness of the 2007 vintage, but also winemaker Greg Gove’s restraint in the cellar. The oak is in the background, allowing layers of fruit, earth and herbs to come through. If you haven't signed up for the club yet, fear not. You can still get in on this first shipment. 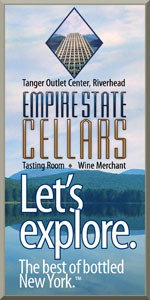 Email Katherine Jaeger, Manager of Wine Clubs, at wineclub@empirestatecellars.com and she will take good care of you. And remember, you can customize your club to include just red or whites wines too if you'd like. Just got our Getting to Know New York shipment today. Looking forward to the rieslings. (We weren't crazy about the Arrowhead pinot when we bought some at the ESC store last month, but the Ravines 09 pinot is pretty good - and completely different from the 08.) This club is fun! Paul: Since you have it now, try that pinot again and let me know what you think! Have you had either riesling before? We haven't had either riesling, no - I think Keuka Lake Vineyards is one of the few Keuka wineries we haven't been to (along with Stever Hill). I know that Roman Roth makes some of my favorite LI wines (and I have his recipe for a hearty mushroom sauce that shows he's also pretty good cook) so the Grapes of Roth bottle is really calling my name. Will let you know about the Arrowhead in a couple of weeks.